IRENA’s annual Renewable Capacity Statistics 2019 indicates growth in all regions of the world, although at varying speeds. While Asia accounted for 61 per cent of total new renewable energy installations and grew installed renewables capacity by 11.4 per cent, growth was fastest in Oceania that witnessed a 17.7 per cent rise in 2018. Africa’s 8.4 per cent growth put it in third place just behind Asia. 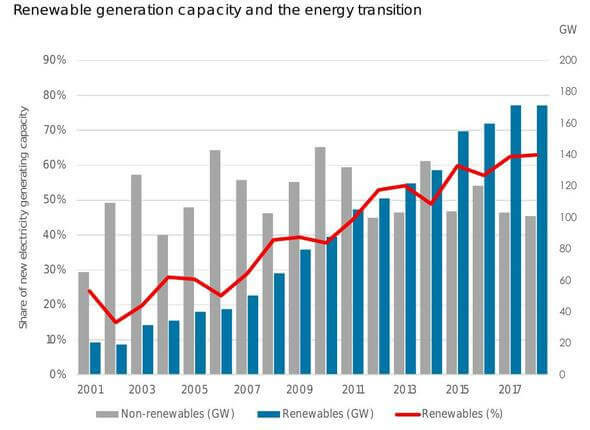 Nearly two-thirds of all new power generation capacity added in 2018 was from renewables, led by emerging and developing economies.